Dave Simonetti, Director of Store Operations for Wawa, Inc. receives his #OpenInPHL kit from Donna Crilley Farrell, Executive Director of the World Meeting of Families - Philadelphia 2015 as Mayor Michael Nutter looks on. 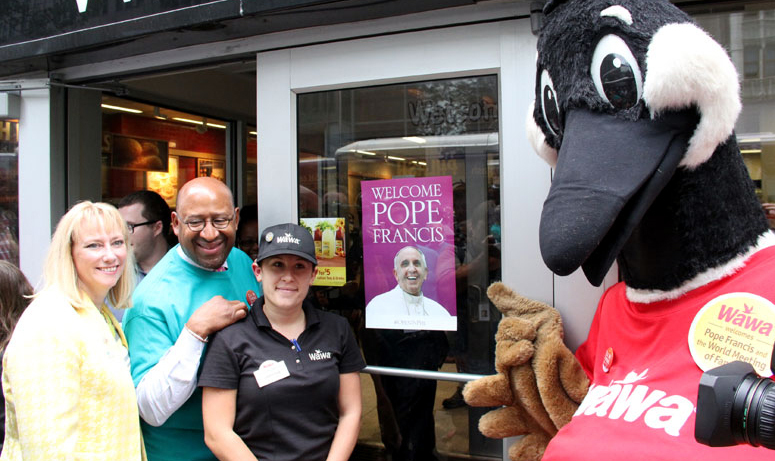 Businesses in center city Philadelphia received promotional kits titled #OpenInPHL and welcomed special visitors Monday, Aug. 31 as a part of the World Meeting of Families’ recently announced “I’ll Be There” awareness campaign. 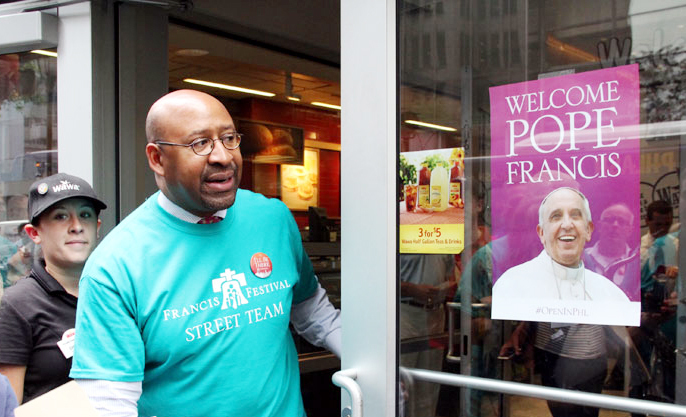 The Francis Festival Street Team — led by Philadelphia Mayor Michael A. Nutter and Donna Crilley Farrell, executive director of the World Meeting of Families — personally delivered #OpenInPHL kits to well-known Philadelphia establishments throughout the Francis Festival Grounds, including Wawa at 17th and Arch Streets, Pat’s King of Steaks, Del Frisco’s Double Eagle Steakhouse and McGillin’s Olde Ale House. 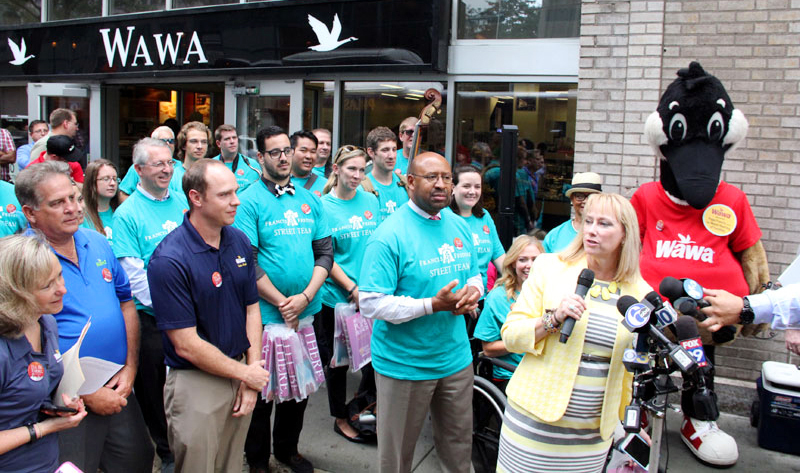 Donna Crilley Farrell, executive director of the World Meeting of Families, and Mayor Michael Nutter along with volunteers distribute #OpenInPHL kits to local businesses including the Wawa store at 17th and Arch streets in Philadelphia. 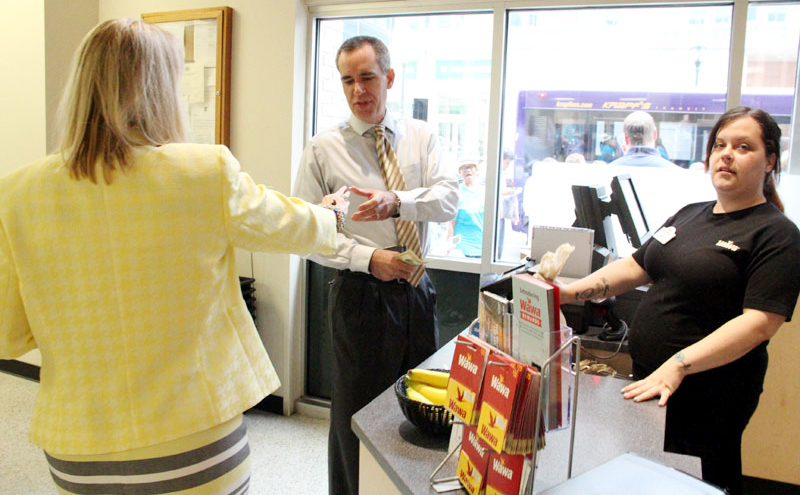 Dave Simonetti, director of store operations for Wawa, receives his #OpenInPHL kit from Donna Crilley Farrell as Mayor Michael Nutter looks on. Donna Crilley Farrell passes out information on the Francis Festival to customers at the store. 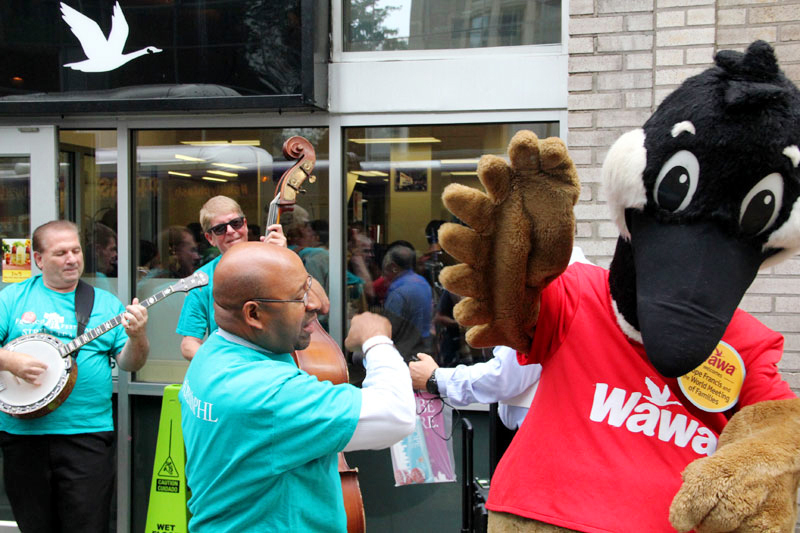 Wally Goose, the Wawa mascot, gets a high five from Mayor Michael Nutter as a string band entertains passersby. As a city resident I so want this to be a success. I plan to be at the Papal Mass with my family no matter what happens. After all, we Philadelphians are used to hoofing it around town and we have a great deal of spirit. However, I think our contributions to this event are being taken for granted. Apparently, no city catholic schools will be represented at the airport to see Pope Francis, only suburban schools. ( In ’79 Little Flower was selected to give a memorable send-off. ) The reason given this time for the omission of city Catholic schools was “logistics” which baffles me. 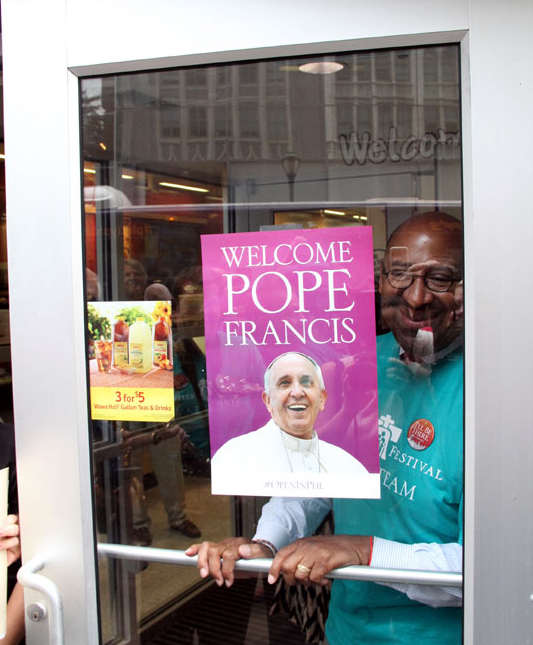 The city residents deserve better representation at the Papal events.